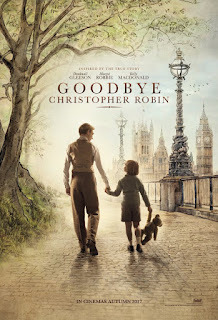 Goodbye Christopher Robin (♦♦♦♦): The interactions between writer Alan A. Milne and his young son Christopher Robin give birth to the story of the bear Winnie the Pooh and his cast of friends in the Hundred Acres Wood. But, as the book takes a life of its own, it also impacts the family in ways they could not have foreseen. Goodbye Christopher Robin more or less opens with a minimal showing of war scenes to illustrate that writer A.A. Milne is traumatized after his participation in the First World War. He dreads the buzzing of flies and bees, the sound of popped balloons... In that endeavor, the film is moderately successful, as is portraying Daphne, Milne's wife, as a frivolous woman when she points out that no one wants to hear of what happened during the war, or think about the losses. Goodbye Christopher Robin succeeds best when it is not taking itself too seriously, such as in the moments Daphne (Margot Robbie) channels the voices of Christopher Robin's plush animals, and in the interactions between Blue (A.A. Milne, Domhnall Gleeson) and little Christopher Robin (Will Tilston) when his mom and his nanny went away and he stayed at home with his father, moments which sparked the elder Milne's creative flash of genius. The chemistry between Gleeson and Tilston is so genuine and intense then that their faces lit up, and one chuckles frequently during those moments. But with fame comes the monster of recognition that seemed, for young C.R., to have ruined the novelty of having had a book inspired by him and his playmates. Showing that, the film succeeds as well, at least with the disillusionment of the child, and not so much with the portrayal of the bullying C.R. was subjected to in boarding school because of his namesake literary character, or the resentment he carried inside, because of it, later in life--likely because we see so little of it. The cinematography is outstanding, as are the photography, the musical score, and the performances by all characters, especially Gleeson's and young Tilston's. With many positive elements working in its favor, Goodbye Christopher Robin is one of the most adorable movie experiences you can have from the cinematic 2017 calendar. Loving Vincent (♦♦♦♦): Taking as tapestry van Gogh's lush Impressionistic impasto, this movie explores the mystery of Vincent van Gogh's final weeks, as narrated by the characters he painted, using 120 of his most famous works, and piecing together his 800 letters. Loving Vincent, a British-Polish co-production, is one of the most unusually creative movies I have ever seen. In it, van Gogh's landscapes and subjects come to life. A movie that comes close to this stylistic gem is What Dreams May Come, starring the late Robin Williams. In terms of topic, I sort of knew beforehand where the story was heading because of my reading of Sacrè Bleu: A Comedy d'Art by Christopher Moore, which more or less starts with an exploration of the mystery. Watch Loving Vincent as much for the lush, creative experience, as for the mystery that unfolds before your eyes. On both counts you will be mesmerized. 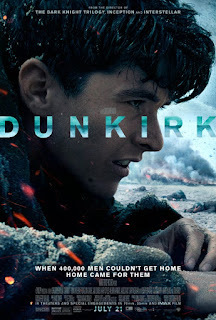 Dunkirk (2017), (♦♦♦♦): The combined forces of Belgium, France, and Britain were pushed back by the enemy towards the sea at Dunkirk in WWII, and forced to evacuate 400,000 troops across the English Channel using mostly civilian vessels requisitioned by the British navy—the navy ones had been disabled or sunken—while being air-patrolled by a limited number of Spitfire planes. From three vantage points (air, land, and sea), and from the points of view of a limited set of characters, more than a war movie Dunkirk is an immersive experience on the scope and devastation of war. Without the ubiquitous gore, with great economy of dialogues, relying more on the instincts and will to survive of its characters rather than rogue heroics, the ever-present musical score, outstanding cinematography, and direction (Christopher Nolan), are the elements that propel this cinematic gem forward. As the film concludes, one feels closer in understanding to what must have felt to be surrounded by enemy forces, waiting for a mass evacuation, on the beach of Dunkirk in WWII. Sounds like three winners and I had not even heard of the first two! You do educate me and I thank you for that. Goodbye Christopher Robin sounds like my kind of movie. I'm going to add it to my to-watch list. It is an adorable movie at times, Angela. I hope that you enjoy it if you decide to watch it. Nice write up of Dunkirk! It is an immersive experience, totally. I especially like Mark Rylance's part and the small boats at sea. And I'm glad you told me about the other 2 movies as well. I've seen those listed on Netflix but haven't tried them yet. Look interesting. I thought Dunkirk was amazing! I haven't seen the other two but I would really like to see Goodbye Christopher Robin. I think you are going to like it, at least I hope so. Well, I read Sacre Bleu and really liked the book. So I will get the movie. I have Dunkirk in my queue. I remember when you read Sacre Bleu because we were just starting to comment on each other's blogs. It seems like it was yesterday. ;-) I'll read your review. Yes, Christopher Robin grew up with emotional scars, but for me that was one of the weakest points of the movie. I hope you like it as much as the other two. I've seen a preview for the Christopher Robin movie and it did look good. I'll definitely see it at some point. 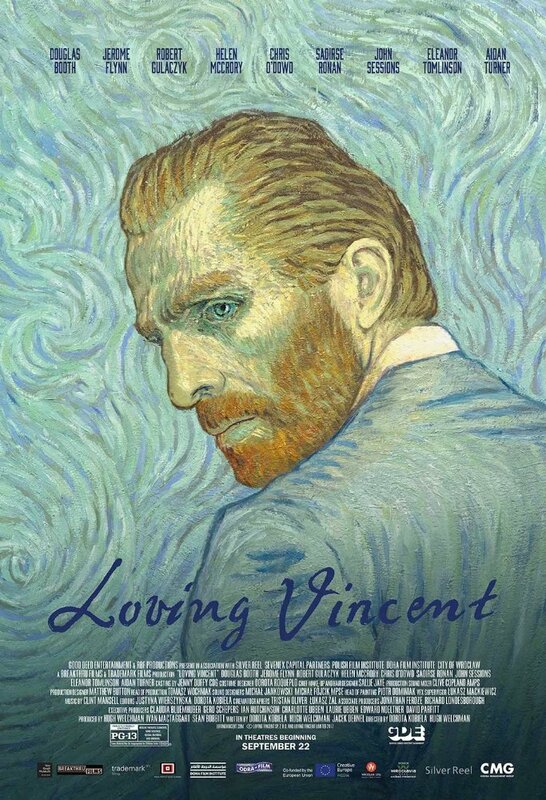 I've not seen the Van Gogh movie but I think I would really like it. We visited the museum in Amsterdam that displays all his work chronologically - the pictures do tell a story really. Plus I read a work of fiction last year (or maybe the year before) that portrayed his time spent in an asylum. It was very good. I really enjoyed Dunkirk. It's an unusual film because it doesn't follow a typical style storyline but it was really good and it definitely brings home how scary it must be to be waiting to be picked up - plus the music was very well chosen and added another level of tension. I would love to see the van Gogh exhibit (if only! ;-) ). He is one of my all-time favorite painters; he was so gifted and suffered so much...I think you would enjoy Loving Vincent a great deal. I recommend Goodbye CR as well; it has a few weak points but it is very good overall. I agree with you on Dunkirk; the music and unusual filmmaking style brought the story home. It was quite an experience.